The stitches for this Christmas wreath fan out from the top and bottom points of each arch. Start by stitching up at the inside (closest to the center of the wreath) point of any arch, move one arch clockwise and stitch down in the inside point of that arch. Stich up in the same place as your first "up" stitch and then stitch down in the next point up from your first "down" stich. Continue until you get to the furthest outside point of the arch. Using the same color, in the same arch as you made your first stitch, stitch up at the next point up from your first stitch, stitch down in the furthest outside point of the arch clockwise to the one you stitched up in. (this will be the same hole as your last "down" stitch). Continue working up the arch until you reach the furthest outside point. Switch colors and do it all again in the next two arches. 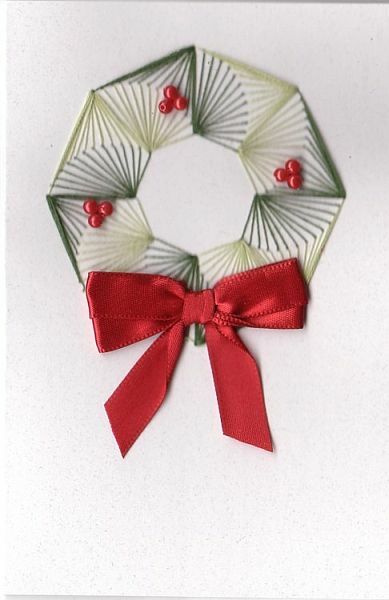 Alternate colors as you work your way around the wreath.